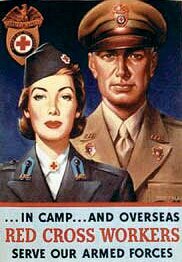 The military-oriented services of the Red Cross was coordinated by field directors who were stationed at stateside Army and Navy stations and hospitals as well as stationed with troops and hospitalized service personnel overseas. They worked in cooperation with the Red Cross chapters throughout the United States and its possessions. This way they linked the servicemen and women with their home communities in a constant two-way flow of service. 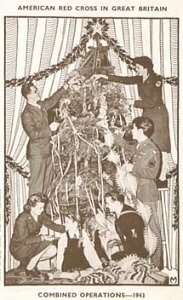 ..
v The American Red Cross contributed to the morale of servicemen and women by a program of social service including financial assistance for service personnel and their families, and by a program of medical social service and recreation for the sick and injured in Army and Navy hospitals. Field directors in Veterans Administration offices and chapter workers assisted veterans and their families in obtaining benefits from the Government. Chapters provide financial assistance pending the receipt of governmental benefits. 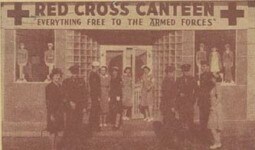 Most large army camps and many other military reservations had Red Cross buildings. Both the Army and Navy allocated space in hospitals for the use of the Red Cross staff in carrying out activities for patients, and furnishings for these quarters were supplied by the Red Cross. 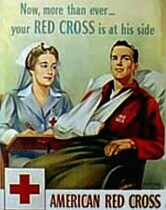 Red Cross hospital workers provided social service and medically approved recreation programs for patients in evacuation hospitals, in general hospitals, and on hospital ships. ..
American Red Cross Service Club .v Club facilities that provided food, lodging, and entertainment were established in metropolitan and leave areas in all overseas war theaters. v . Aero-clubs, clubmobiles, and on-post service clubs were also staffed and operated by the Red Cross according to indicated need and request for such service by the military authorities. Camp and Hospital Council Service . Duty: Provided emergency services, supplemental services (such as art exhibits and hospital parties) and delivered extra supplies ranging from books to musical instruments, to 4,096 military stations and hospitals within the United States. Duty: Served both overseas and in stateside military locations to provide counseling and guidance for service personnel having either military or personal problems, facilitated communication with families and hometowns, rendered financial assistance and distributed requested supplies. 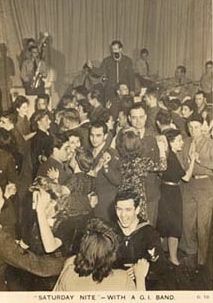 Duty: Operated large service clubs (such as the famous Rainbow Corner Club in London) and small service clubs (such as Doughnut Dugouts for troops, Fleet Clubs for sailors and Aeroclubs for airmen); operated clubmobiles and cinemobiles (clubmobiles converted into mobile movie theaters) in forward or isolated combat areas; staffed and supplied 2,000 recreational facilities overseas, and maintained presence in staff homes and stateside hospitals. Duty: Maintained close contact with the Camp and Hospital Service field directors to remedy problems of service members, gave consultation; facilitated communications between service members and families, and provided financial assistance based on need. Duty: Provided social, medical and psychiatric services for military patients in overseas and stateside hospitals by paid Red Cross social workers and professional and specially trained personnel, supplemented by recreational programs provided by unpaid volunteers. 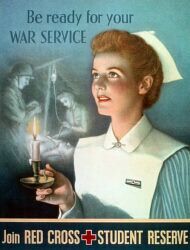 Duty: Recruited and enrolled nurses, and certified those qualified for military service for duty with the armed forces. Service in Veterans Hospitals (SVH) . Duty: Provided service to hospitalized veterans in Veterans Administration hospitals within the United States by using both paid professional staff, Gray Ladies and Nurse's Aides.
. Insular and foreign operations of the American Red Cross included activities in the nine chapters in insular possession's services to the American military forces outside the continental limits of the United States, relief to prisoners of war, foreign disaster and war relief operations, and relationships with the foreign Red Cross societies and with the two international Red Cross organizations (the International Red Cross Committee and the League of Red Cross Societies). .. The American Red Cross, at the request of the Army and Navy, provided recreation and welfare facilities for US armed forces in foreign countries and islands. There were Red Cross medical social workers and recreation workers in the overseas hospitals. Other workers were stationed inside the camps and with the troops, wherever they served. Relief to Prisoners of War: The American Red Cross endeavored to provide regular shipments of food parcels, toilet and comfort articles, clothing, and medical supplies for distribution to men to captured Americans, whether held as prisoners of war or held as civilian internees. 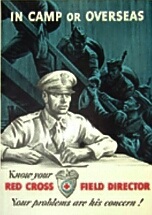 The International Red Cross Committee maintained a central agency for prisoners of war at Geneva. 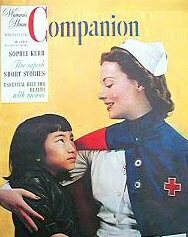 Civilian Relief: The foreign relief of the American Red Cross made necessary by World War II was undertaken in over 41 different countries. This work was carried on in close cooperation with the United States Government and the Red Cross society of each country that received aid. ..